In this Ninja Coffee Bar review, I’m looking at what the Ninja Coffee Bar (and Coffee Bar System) actually does and how the different versions compare to one another. Which is better, for example—a glass or thermal carafe? Do you need a single-serve model or one with a full carafe? 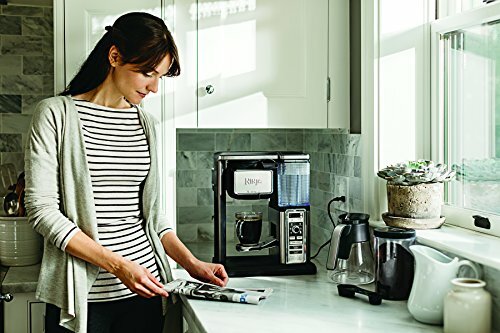 Does it do everything you need your coffee maker to do, or do you need different machines that serve different purposes? How Is the Flavor of the Coffee? 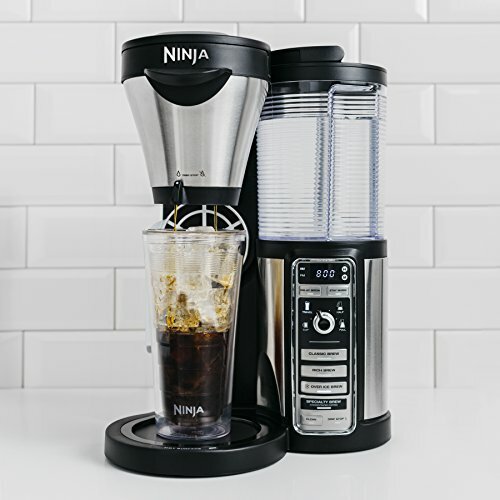 The standout feature of the Ninja Coffee Bar line is its ability to make everything from a full pot of brewed coffee to a specialty drink (and froth the milk). Between those extremes, you can make just half of a pot of coffee, a single cup, an extra-large cup, an extra-large multi-serve amount, or a to-go cup. The regular Ninja Coffee Bar and Single Serve System do not make all sizes, but the Ninja Coffee Bar Systems do. Each model comes with a permanent filter, frother, recipe book, and removable water reservoir for easy cleaning and refilling. There’s an optional upgrade of an over-ice carafe, though any of them can create iced drinks (but in a cup, not a carafe). You get so much variety in the types of drinks you can make. It’s easy to use. It’s incredibly user-friendly from the measurements on the double-ended scoop to the layout of the knob and buttons you use to make the perfect cup or pot of coffee. You can brew a regular pot of delicious, hot coffee in it (excluding the Single Serve System, of course) if you’re not in the mood to make more of an effort for a specialty drink. You can set it to make your coffee the night before so you wake up to a fresh pot in the morning. The glass carafe version keeps the coffee hot for up to two hours after the pot is made (the thermal one relies on the heat-retaining abilities of the pot instead of a warming plate). The coffee tastes good, and from my experience with the glass carafe model, it’s nice and hot for at least two hours after it’s been brewed (you’ll need to drink the specialty drinks right away, though). It’s inexpensive compared to similar machines. No need for paper filters; this one is permanent. You can take it out and clean it, though. Replacement filters are available on the Ninja Kitchen website if you need one. It doesn’t steam the milk for you. It only froths it. It requires two cups almost every time you want a hot drink with steamed milk because you’ll have one mug in the microwave (or waiting to have milk heated on the stove poured into it) that you’ll froth later, and one will be catching the coffee. You could potentially do it all in one mug by frothing the milk first and brewing the coffee into it, but that process takes longer and if you’d like to stir flavored syrup into the coffee, you won’t really be able to without disturbing the frothed milk. It doesn’t actually make espresso, just very strong coffee. That doesn’t bother me, personally, and the average coffee drinker probably won’t mind. I’ve made mochas for myself that tasted better than anything I’ve gotten in a coffee shop with this machine. However, it’s worth noting to avoid confusion. The design of the water reservoir makes it easy to spill water if you’re making a full pot of coffee (assuming you take it out to fill it at the refrigerator instead of filling it up while it’s on the machine). The water reservoir doesn’t always want to stay perfectly in place. I’ll probably always prefer the pour over method for coffee because I like to drink it black and I feel like this is the way to get the “cleanest” tasting cup. That said, I only bother with that method on lazy weekend days and I still drink my coffee black most mornings even when I use the Ninja Coffee Bar System. I don’t know a whole lot about what goes into the Advanced Thermal Flavor Extraction® process or technology, but it apparently works quite well. I’ve had so many other coffee makers in my lifetime and the coffee from this machine is noticeably better. I feel like the Ninja Coffee Bar gets as close to the full flavor profile of coffee as a machine can possibly get. Because these machines don’t take pods—even for the single cups—you can really have fun with that by choosing different types of fresh coffee. To always have delicious coffee, you’ll need to make sure you keep the coffee pot, filter, and brew basket clean (I hand wash mine with regular dish soap) and also clean the machine as a whole when the light comes on to signal that it’s time. There are different instructions based on model number, and I just use the white vinegar and water method listed as an option for mine. I’ve noticed that waiting a few days when the light comes on makes my coffee take on a sharper flavor. Not good. The machine has a pretty hands-off cleaning cycle for the most part. For mine, I put water and vinegar in the reservoir and push a button, wait an hour while it works its magic, pour the water out of the carafe and refill the reservoir with water before pushing the button again. In about 15 minutes, it’s done. I rinse everything again just to make sure I’ve gotten rid of all traces of vinegar. The glass and thermal carafe systems are about the same size. If you need a more compact option and the features work for you, the regular Ninja Coffee Bar or Single Serve System may be a better choice. When you shop, you may see a different model number that matches the general description of the Ninja Coffee Bar. Each model has several numbers, so don’t let that confuse you. They’re not different. Just make sure the name and features are what you’re looking for. The Ninja Coffee Bar does not include the café forte option, while all other models do. It also does not offer the XL cup or XL multi-serve option. I don’t personally choose the café forte option very often (I usually forget it’s there), but if you’re used to a huge, steaming cup of joe in the morning, you’ll miss the XL options unless you’re making a half or full pot. There’s no integrated coffee scoop in the basic Coffee Bar design, either, and it comes with the Ninja Easy Frother, which is not the built-in model the other machines have. This is truly a basic model. I enjoy having the handy scoop with measurements right on it and the built-in frother that folds right in next to the machine. There’s nothing else to store and it’s dishwasher safe. 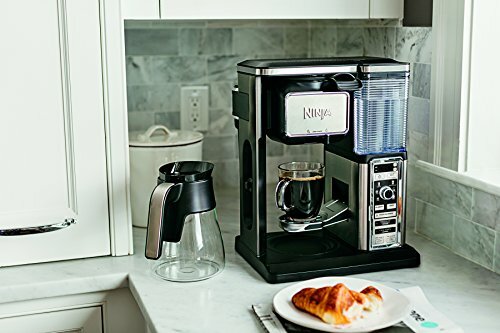 The Single Serve System can only brew a cup at a time (regular, XL, travel, or XL multi-serve), of course, while the others can brew all of those cup sizes plus a half or whole carafe. It has no warming plate. Unless you really prefer real espresso and almost never brew a pot of coffee (or have a separate coffee maker you love), yes! This can create all types of drinks, it’s fairly compact considering everything it does, and it’s inexpensive. You can take your pick of several different types of drinks, whether you want iced, hot, or just a steaming cup of hot brewed coffee.